Dry Car Wash! As crazy as it seems, you won't go back! Is it really possible to have a clean car without water? The concept of a dry car wash goes completely counter to mainstream . As society we live under the natural thinking that more is better. 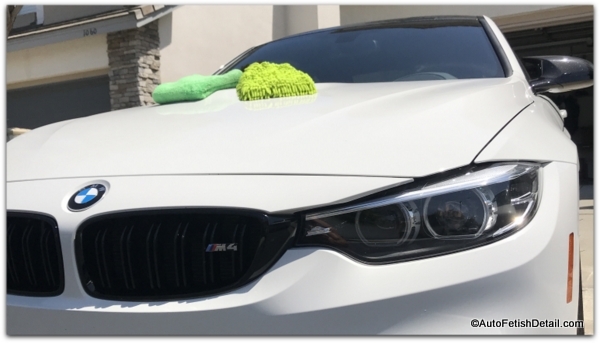 When it comes to washing our cars I don't know anyone who doesn't naturally follow the suggestion that the more water and soap they use, the cleaner their car will be; somehow it just feels right when we see our car getting bathed in gallons of water and mounds of smell-good suds! But the idea of waterless car washing and the recent products now on the market fly's in the face of traditional thinking. The interesting thing for me personally is that I have been employing these same methods for over ten years in my professional detail business. What is Dry Car Wash? Go waterless and get better results in less time! Try waterless and never go back. Yes, it really is safe. Spray area with chosen dry car wash.
Work one panel at a time. Use one micro-fiber to wipe up dirt and dry wash solution. Use second micro-fiber to buff area to a shine. Instant results that are both spectacular, quicker, and easier! Is Washing Your Car Without Water Safe? Yes. But like every other area of life this can (and is) forever debated. Because this goes completely counter to what seems logical, it is easy to find yourself debated the merits and safety of this process. Most would argue that you will be scratching the paint during the process. 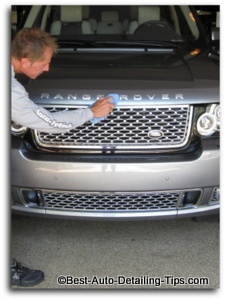 I have an opinion on this very topic that can also be applied to many other areas of car care and detailing. Many people become preoccupied with things that aren't actually relevant; in this case scratching. At some level you cannot even touch your car without "scratching" the paint. So scratching becomes relative. Meaning, what degreee or level is scratching an issue. If you are scratching your car in ways that cannot ever be observed with the naked eye, and it would require the use of some form of microscopic tool to see the scratches, does it really matter? I say not! This same debate rages on with regards to car waxes; if you have to stare at a car for minutes of time in order to try and perceive the differences between one wax or another, then does it really matter? It is easy to get sucked into these mind numbing debates all so one "expert" can reign superior over another "expert". You will see this frequently in the car and detail forums and it is nauseating! If you apply common sense, not only will you see this method is very safe, but superior to traditional car washing methods. You can seriously have a car that is not only clean, but is waxed at the same time....and looks it! Within the world of advanced chemical engineering, you are filled with almost limitless choices; this represents both the good news and the bad news. The good news is that you could almost grab for any top rated waterless product like the one's below, and you will have a sure thing. The bad news is that you might find yourself reading endless reviews trying to find the "perfect" dry wash product, but all you end up with is more frustration and you still have a dirty car! Any of the following products will produce excellent results and if I had to pick a single product as my recommendation I would go with the Griot's Garage as it is a quality product and also comes with the cloths! Excellent dry car wash product. As easy as easy gets. This is what is called a RTU (ready to use) product. No mixing required. Another top rated waterless wash product. Ultima Waterless Wash Plus Anti-static Dust Repelling Concentrate Kit with Empty Bottle and Sprayer for Auto, Truck, RV, 16 fl. oz. Not as many ratings on Amazon; but it is a more obscure product used by professionals. Comes with the empty bottle to mix the solution in. Another top rated dry car wash product. 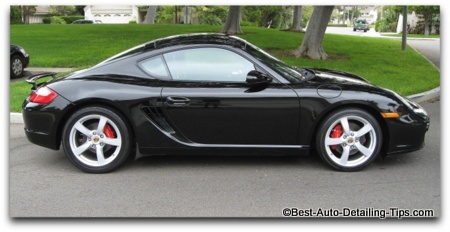 A top rated product from what most consider a top rated company among car enthusiasts. I have never been disappointed by any of the products from Griot's Garage. Also one of my top picks. Once you have picked out the waterless car wash product, you will need the right "tool" for the job so you can produce both safe and professional grade results. I realize some of the kits above come with micro-fiber cloths. And by "tool", I mean true professional level micro-fiber cloths that are ideally suited for dry wash methods due to their thick naps. Top-rated micro-fiber cloths ideally suited for waterless washing. Thick nap to trap and lift dirt. One of my favorite brands that I have tested out. When it comes to waterless washing and the No-Rinse products; thick is best. First came quick detailers for light dust and final wipe downs. Then came true waterless products simply to remove dirt without the water and bucket. Then came the waterless products with visual enhancers. Now we have waterless products that are true wash and wax products. People, enthusiasts, and detailers scoffed at this from the beginning. Now as more and more people experience the benefits and superior products fist hand, they become loyal fans. I have yet to see a person go back to traditional methods once they give it an honest shot themselves. I had a neighbor to one of my clients who used to observe me many years ago doing this method. He was completely intrigued to the point where he eventually came across the street one day while I was working and inquired. I explained the unconventional process to him where he commented that I need to market the idea myself. Well, clearly I didn't get around to it but this obviously doesn't prevent you from enjoying the benefits yourself firsthand.